FilmDayton Celebrates 10th Anniversary by Rolling Out the Red Carpet For the Sneak Peek Of The Grand Hall at Liberty Tower. 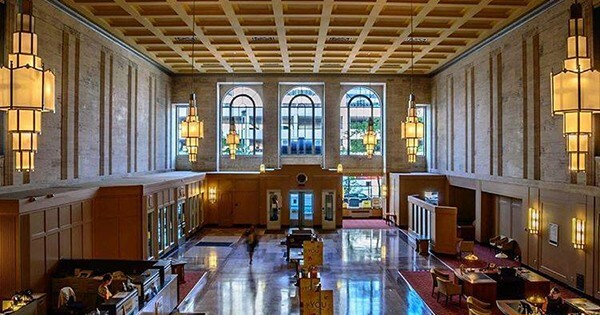 Dayton’s newest Special Event Venue will pull back the curtains to celebrate FilmDayton’s 10th anniversary on Thursday, September 27th from 5:30-8pm, in The Grande Hall, at Liberty Tower. This is the very space that served as the set of Robert Redford’s The Old Man and The Gun. While the venue is still under construction, this sneak peek will give guests a chance to stand where Robert Redford did, enjoy appetizers on the Mezzanine where Tom Waits stood lookout, or have a cocktail the bank vault where Casey Affleck investigate the robbery. The new event venue is expected to be open for bookings in Winter 2019. Tickets start at just $15 with VIP tickets available that will include movie tickets to The Old Man and The Gun, a swag bag and more! Created in 2008, FilmDayton's first victory was helping the state pass a competitive film tax incentive in 2009 which would attract film projects to Ohio. We then worked to showcase locally made films through our film festivals and educate a diverse workforce to fill the jobs created as productions took advantage of The Ohio Motion Picture Tax Credit. In 2016 we officially became The Greater Dayton Film Commission, educating, promoting and advocating for growth of our local film industry. FilmDayton offers concierge services to productions that include permitting, permissions, crew recruitment and location scouting for productions to drive economic development for our 9 county region. FilmDayton does not receive any funds from the media productions we work to attract here. We rely solely on contributions to advance our mission. FilmDayton has been successful in bringing films like Miles Ahead - an exploration of the life & music of Miles Davis, Goat- a fraternity drama produced by James Franco that starred Nick Jonas, Boy Band- a comedic feature by Yellow Springs Director Joel Levinson, produced by Dayton’s Physis Films, and most recently,The Old Man and The Gun. There have also been a number of reality tv show episodes filmed locally including A&E’s Hoarders, HGTV’s House Hunters, MTV’s Catfish, as well as numerous shorts and documentaries. Find more events like "FilmDayton Celebrates 10th Anniversary!" FilmDayton is a non-profit, volunteer-driven organization dedicated to building the Dayton region’s film community.